The Poetry Translation Centre is based at The Albany, a creative hub in the heart of Deptford. This is where we hold our poetry translation workshops. You can plan your journey on Google Maps here. It’s easy to get to the PTC, no matter where you are coming from. 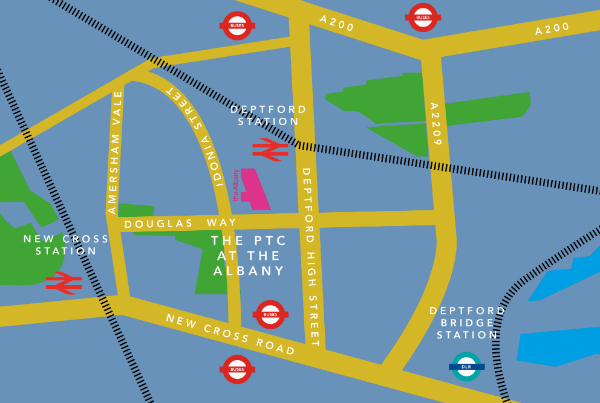 We are located just two minutes’ walk from the step-free Deptford Station and only eight minutes from New Cross Station with its rail and Overground links. We are just ten minutes’ walk from step-free Deptford Bridge DLR station. You can also reach us by bus. The Albany is situated just off Deptford High Street and there are loads of local bus routes. On New Cross Road the closest bus stops are E and F using bus routes 53, 177, 225 and 453. On the A200, to the north of Deptford High Street, the best stops are A and C on bus routes 47, 188 and 199. There is step-free access to our office and workshop space, as well as to the café and toilets at The Albany. The Albany also has disabled parking at the rear of the building. Assistance animals are welcome both at the PTC and throughout The Albany. The Albany has an accessibility webpage including video guides for getting to the venue. There is free street parking available close to the venue on Watson’s Street, Octavius Street and Frankham Street.